Glorious Globes: October will be available for purchase October 15th. CLICK HERE for further product details. Words to Live By: Peace will be available for purchase October 15th. CLICK HERE for further product details. Warmer Together will be available for purchase October 15th. CLICK HERE for further product details. Bold Borders: Flurries will be available for purchase October 15th. CLICK HERE for further product details. You have until 7am ET, October 13th to leave your comment and be eligible to win. Only one comment per person please. One randomly selected winner will be posted on the October Release Winners Page by 10PM ET on October 15th. To see more from Kimberly Crawford, CLICK HERE. Always amazed at the different Globe releases! And they can be used so many ways. Beautiful day 3! I love the Peace Words to Live by and those penguins sure are cute! Warmer Together is simply adorable. Heartwarming indeed! WOW! Another amazing group of creations! LOVE Bold Borders Flurries!!! Wow, love those little penguins! Then snowflake border is beautiful too! I really like this release of the globes and the warmer together penguins are adorable. Such cute little penguins and another great month of Glorious Globes! Absolutely loving the Flurries bold border, so gorgeous! Those penguins are fantastic! And I love the new Bold Borders. Bold Borders: Flurries is a lovely addition to this series. Great job design team-fabulous inspiration! What perfect sentiments for this season and these times! The Joy die is beautiful! 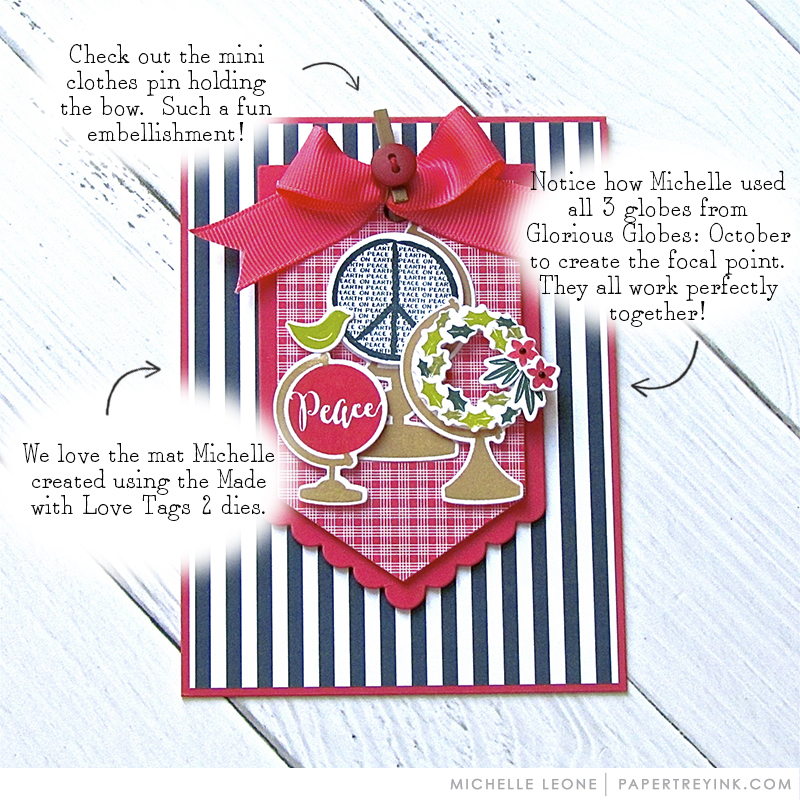 You had me right off the bat with Michelle’s first globe card – gorgeous! Lovely projects one and all ladies. Oh my! Such lovelies!!! Amazing Inspiration! Laurie’s penguin card with those penguins stamped on Kraft? I love it!!! Glorious Globes-October! lovely!!! SO many new products to have SO much fun with! Thank you, Papertrey Ink!!! I love the new Joy die, the font used is really elegant and stylish. Oh my! I love everything in today’s products! I love the words to live by, the glorious globes, the penguin layers set, and the bold border snowflurries! Love the bold borders and cute penguins. The new Bold Borders: Flurries is gorgeous! Love it. Love the penguins and the Globes. It will be hard to decide which one to get. A whole penguin family…oh my!!! I adore the penguin set and was pleasantly surprised because I didn’t remember it from the sneak peak video. Oh, the penguins are precious. I also have a weakness for PTI’s tags! Love the bold borders this month. 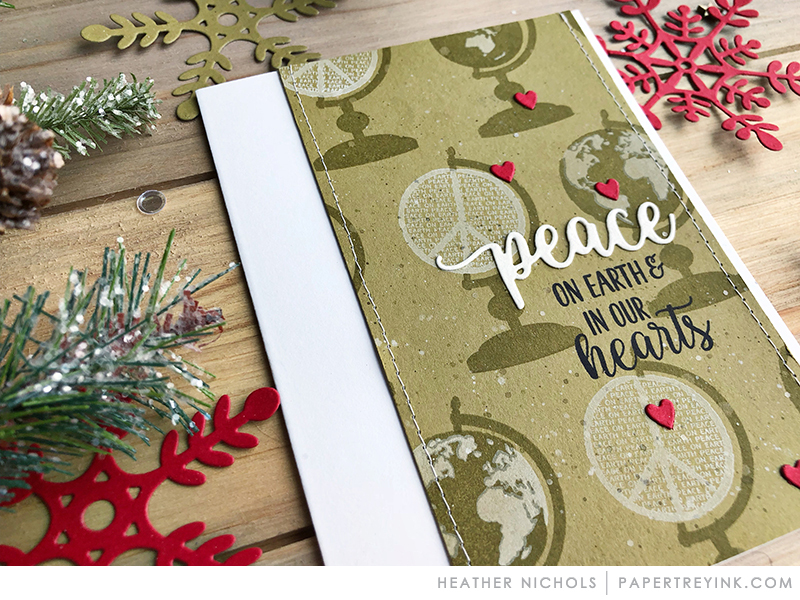 Plus the globes and peace sentiments are perfect for the Christmas season. Another day of fabulous samples too! Peace is one of my favorite sentiments! Love that it is front and center today. Beautiful projects by all! Love the Penguins! What a beautiful release! I love the Words to Live By: Peace stamp sets and Bold Borders: Furries! 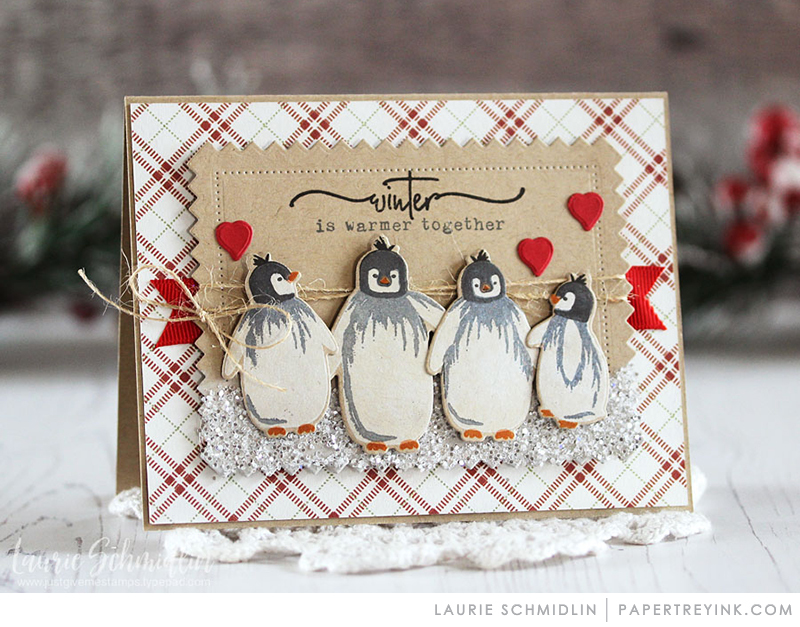 Ooo-Love the Bold Borders, a must have, and the Penguins are too cute! I really like the new bold borders! So many beautiful projects and sooo many things that are now on my wish list! The penguins, the globes, peace… just love all of it. Wonderful new things keep coming!! Such a happy new release!! I’ve just now had a chance to catch up on this month’s release. It is fantastic! There are so many cute stamp sets. I love all the cards and tags from the team! Love the new bold borders die and that Warmer Together set is so stinkin’ cute. 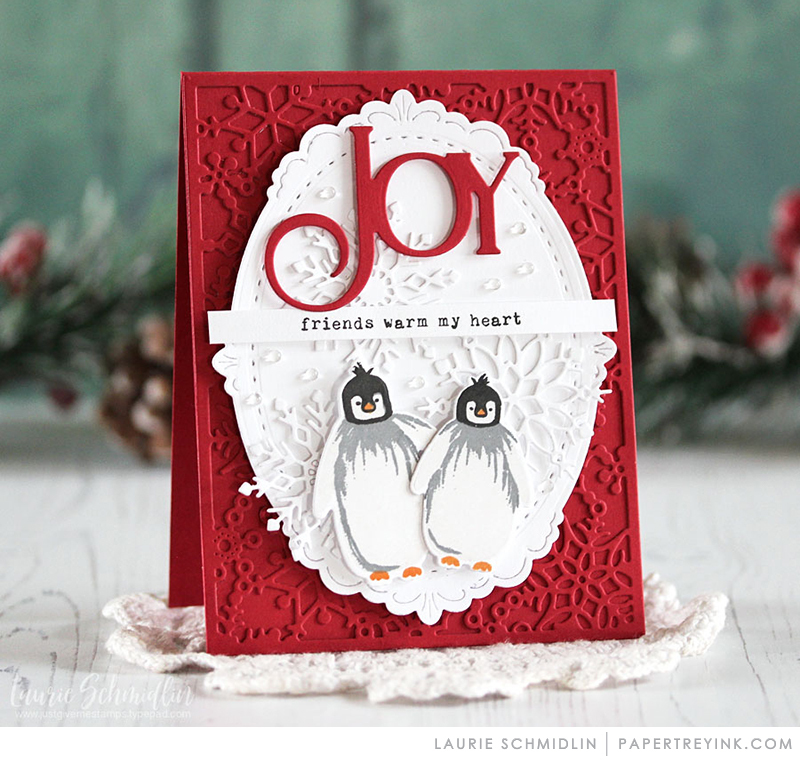 The penguins are adorable and the flurries bold border die is a perfect complement to everything Christmas. Beautiful holiday products! 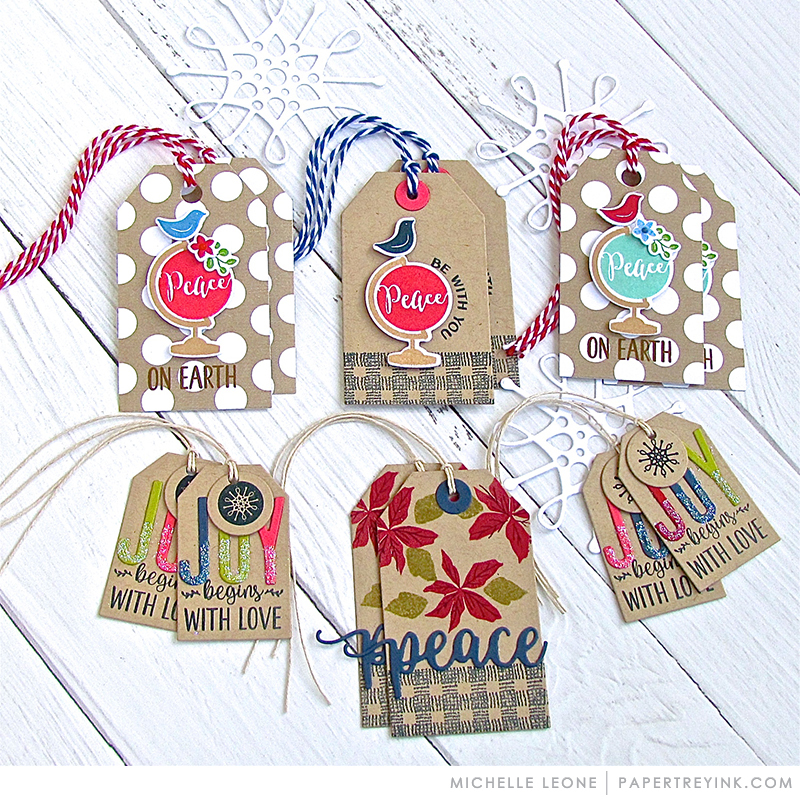 I especially love all the peace tags. Really love your Bold Borders series…and this new one is exceptional. Love the new globe designs! Those penguins are adorable! I’m really in awe of the creativity of the PTI design team. All the cards today are gorgeous. Oh my, what a lot of gorgeous projects today! Love it ALL!! Can’t wait to get my hands on those penguins! There is so much inspiration in today’s release post. I love the bold borders! I love the new Bold Borders. Great! But those penguins are my favorite! I love the large Joy, the frame, and the penguins. Oh my! So cute. I love those adorable penguins!! This whole release has been amazing!! The penguin set is adorable! The pretty stamped wreaths are a favorite too. So much eye candy! 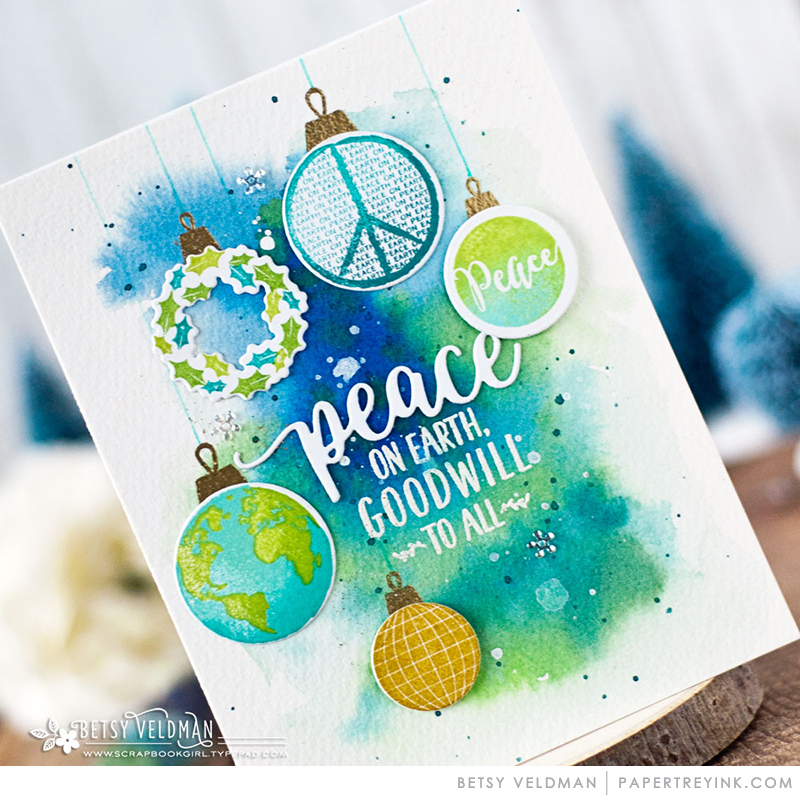 That globe/ornament watercolored card by Betsy is just stunning! Wow! 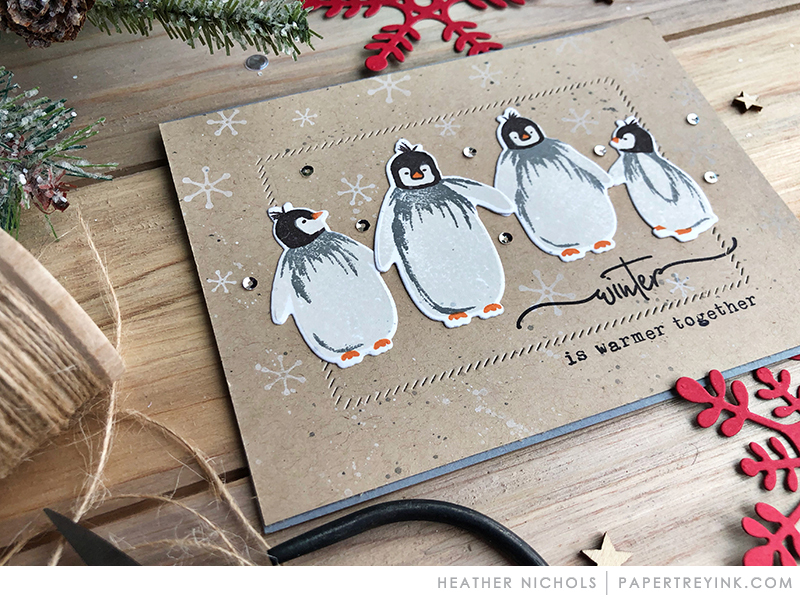 Cute penguins, beautiful die cut words, new globes and amazing cards by the team! Lovely projects today! I’m really liking the large joy, it’s beautiful! Love the bold borders and those penguins are adorable! 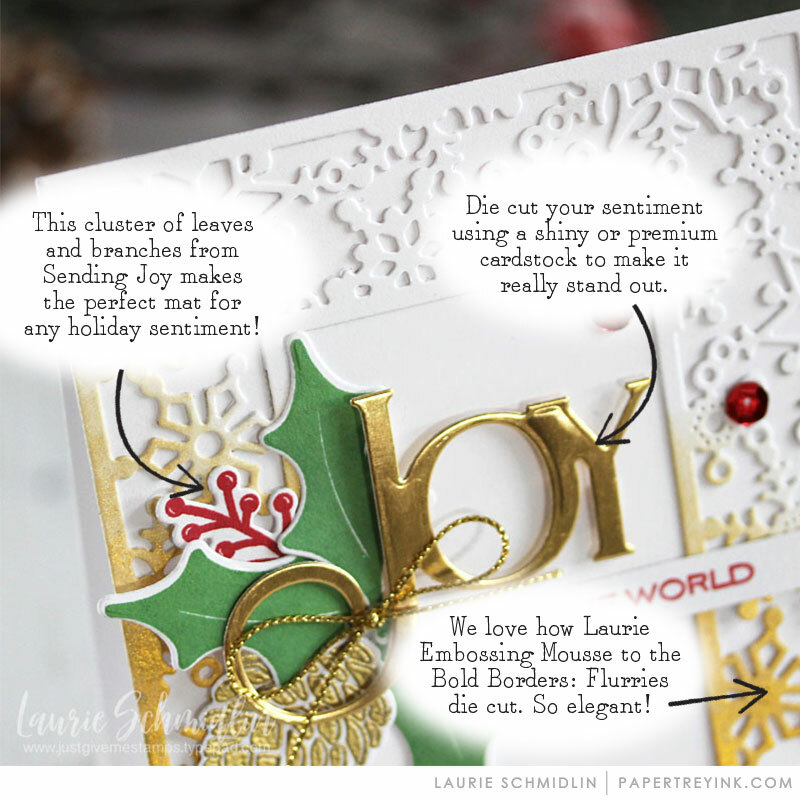 Love the Bold Borders: Flurries (the Joy die is gorgeous!) and Words To Live By: Peace. Those penguins are too cute! Lots to love! I am so excited about this release cannot wait to get my hands on some wonderful new stuff great projects again today ladies loving it. I’m always in awe of the design team’s artwork! Really love the Bold Borders! Today’s cards are simply amazing! Love those penguins! Those penguins are adorable! They are calling my name! Definitely need that penguin set! Super adorable! The design team never ceases to amaze with their creativity and inspiration! Love the Bold Flurries die, the penguins, globes, you name it, all gorgeous! I haven’t felt the need for any of the Glorious Globes sets, until this month. I just love that tiny holly wreath! I love Bold Borders: Flurries too! More globes to add to my collection!!! Awesome designs! Brilliant third day! I adore the penguins and the globe wreath…thank you DT and PTI for the inspirations. So many beautiful cards today! I love everything. The penguins are adorable. What an amazing release! What a lovely new release! Inspiring me to get crafting for the holidays–but too many temptations! You’ve outdone yourselves again! Love the Bold Borders: Flurries and the Joy die it comes with! This Christmas and winter crafting is going to be special. Your release has the most beautiful designs of all. I love them all! Wow, gorgeous cards ladies! I so enjoy these releases when you showcase so many wonderful creations. It’s a feast for the eyes. Wow! My daughter’s family loves penguins … this is going to be hard to resist getting! But, I really, really love the Joy die and snowflake border! Decisions, decisions! Those penguins are too cool! Love the new bold borders and prace words to live by but those penguins are to die for. So adorable! Such unique ideas! Can’t wait for the 15th! Words to Live By, LOVE! Love the globes and the penguins. Great Penquins! As Dawn said not too too cutsey but cute! You all have great details on your cards and I see peeks of more to come! Can’t wait! Pretty way to share Joy! I am definitely ready for holiday crafting after seeing all of these gorgeous projects! Love the font on the word “Winter”. Beautiful. Another great peek! Love those penguins. 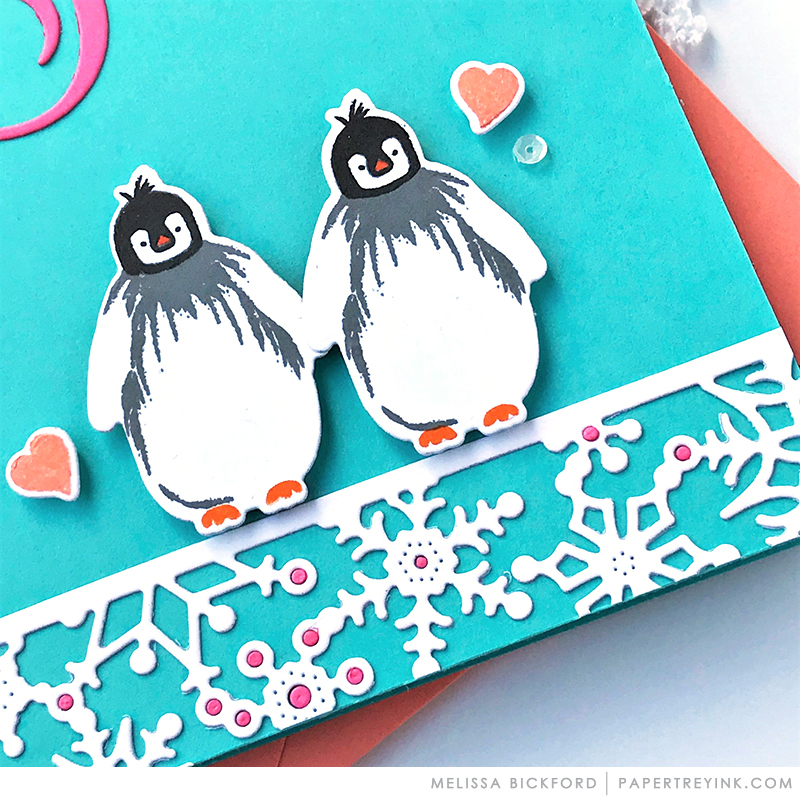 Penguins are a favorite, love how the design team colored and used them on their darling cards! All wonderful today! Thanks for the beautiful designs and ideas. Great release day. The globes, peace and bold borders are gorgeous, but the Warmer penguins are out-of-this-world wonderful…the cutest little critters. Love them. The large JOY is a must for any collection – that font is gorgeous and really makes a statement! So many delicious ways to use the release. Another day of great products. I just don’t know what to choose. Love the versatility of these sentiments. Gorgeous samples today! I asked for realistic penguins and here they are!!! So cute, this is a really good release. Today’s projects are fantastic! Love the snowy border and those sweet penguins! So many fun goodies! Those penguins are so sweet. This release is wonderful, I need so much in it, I don’t know if my pocketbook can handle that. so many incredible creations today…so in love with those sweet and adorable penguins! and the globes are fabulous, love the wonderful wreaths created from them. Warmer Together has stolen my heart today. The penguins are so cute. Love the penguins! So cute. Every card that was made with them stood out! Love the Snowflake Border die! All of these holiday items are certainly making me look forward to Christmas. Love all the color inspiration too! Love the Words to Live By sets, and so inspired by the globe projects! Wow, wow, wow! Love every new product & every project! My brain is on overload now–so much inspiration! Oh my goodness! Warmer Together is so cute! And the snowflake border die is very elegant! Today’s projects are outstanding! Loving today’s « peace » theme, a must-have for me. So many inspiring projects. Another fantastic day! I love the sweet little penguins and the new globe set is beautiful! I am loving all of the festive inspiration from the DT!!! And what a wonderful new release! 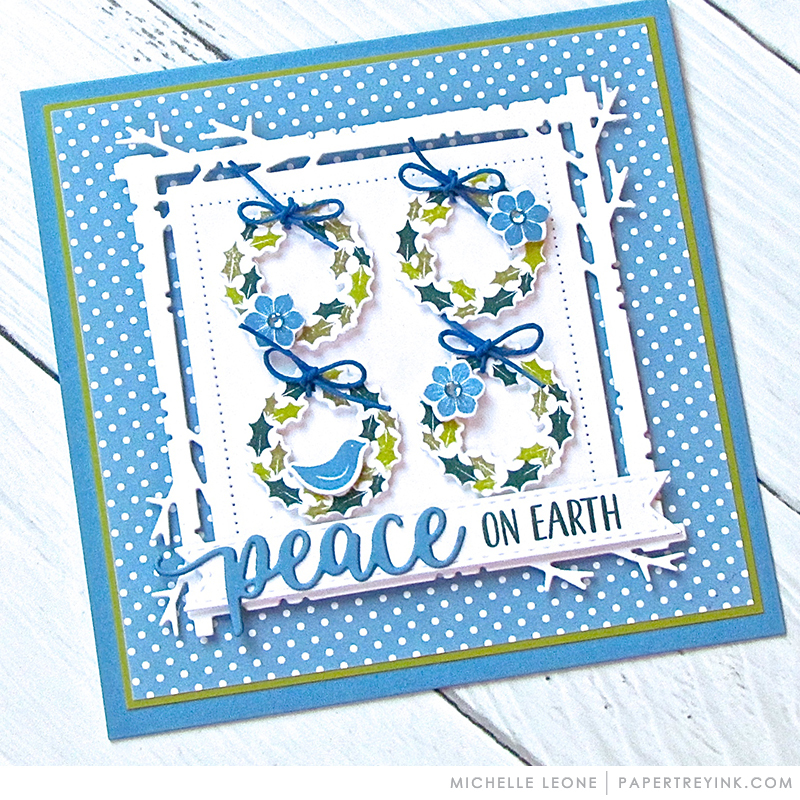 Especially LOVE the flurries border die—SO GORGEOUS! Awesome work ladies! Loving all the Christmas ideas flowing here. Thank you. The DT did an amazing job today like always. Beautiful projects! I love so many things in this release. The Flurries set is my favorite and is definitely going on my list! Another stunning day! So much creativity! I love it all, especially the penguin family! Super cute images! Love the sweet penguins! The globe and the wreath are amazing! Sweet size. The flurries border die is so pretty. Love how it frame the middle. Wonderful samples ladies. Those tags are so sweet!!! Those penguins are SO stinkin’ adorable!! Wow!! I love the penguins, cutest little penguins ever!! Such a Wonderful release!! I love it all! Cute penguins. Beautiful card ideas. The Design Team has done such a wonderful display of these new products. Each one is unique . Can’t wait. I’m thankful for all the beautiful inspiration. The joy and globes will be great to add to my stash! What a wonderful release. Especially like the Peace sentiments. Wow! I love the Peace stamps and die. 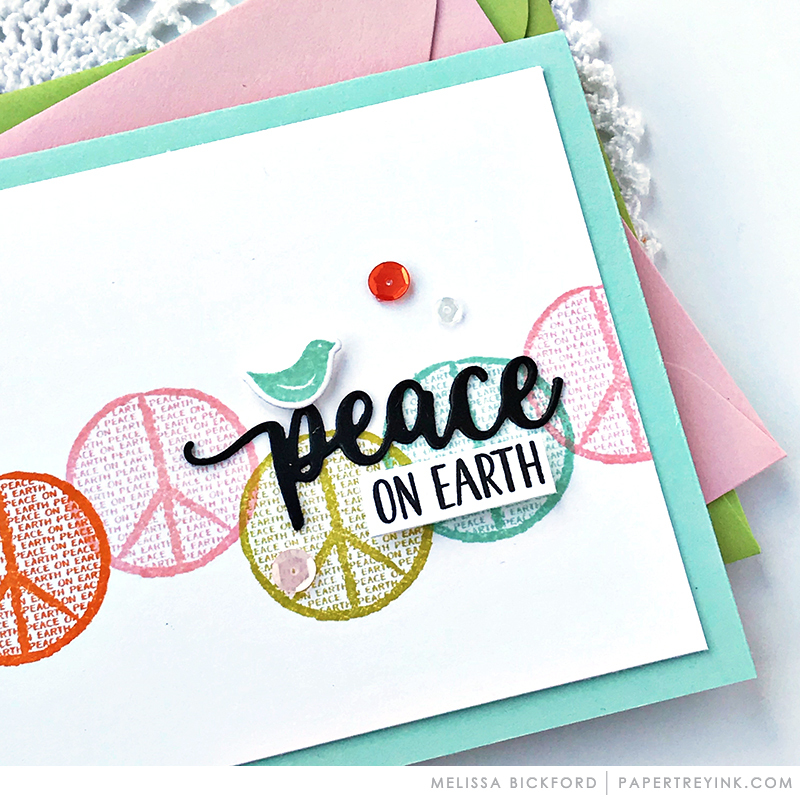 I love everything today…bold borders is another favorite, Ways to say peace and of course the cute little penguins! awesome projects by the design team! Penguins are so adorable. Betsy did an amazing job designing these! The Bold Borders: Flurries die is gorgeous! Great projects in today’s post. Love the joy and peace sentiments. Great projects! I am really loving the penguins! Bold Borders: Flurries is great and the penguins are wonderful! Everything is so fun today, especially the penguins. I’ve collected penguins for years but have very few stamps with them. These guys are just darling with a nice variety of sizes. Bold borders is just beautiful. A must have. As soon as I think I know exactly what I’m going to order, you throw something in that I just have to have! Love the Flurries die and those sweet penguins! So many must haves from this release. Adding Warmer Together and Flurries Bold Borders to my wish list! Oh my goodness those penguins are the cutest! As usual, everything is gorgeous. I’ll definitely be going for the Bold Borders: Flurries and the Words to Live By. We can always use more peace. I think today’s my favorite day so far! So much to love, especially those adorable penguins. Can hardly wait to see what’s next. I am absolutely smitten with those penguins! Warmer Together and Bold Borders are my favorites today. Lots of wonderful samples today ladies! Thank you! Awesome DT samples! Love the tags and the penguins are toooo stinking cute! Awesome products for beautiful and festive creations!!! Lovce so much Warmer Together!!! 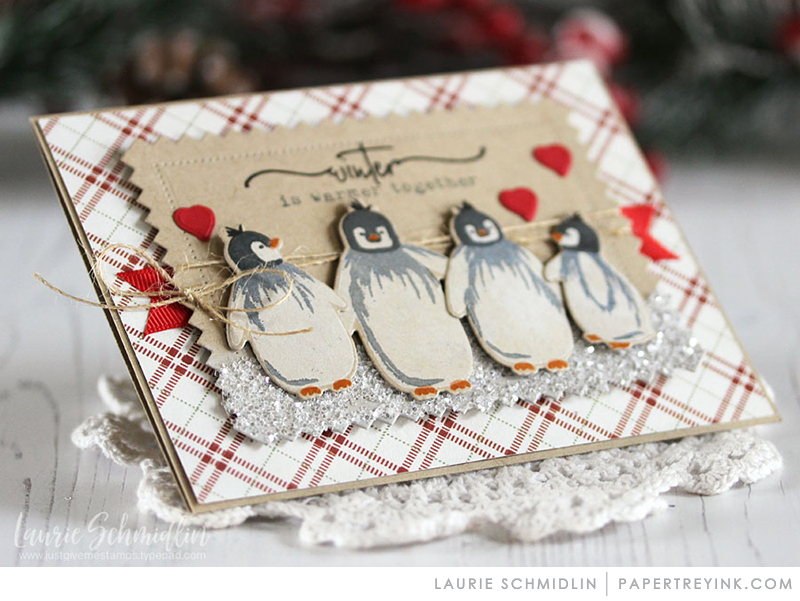 I adore the flurries border die and those penguins! How adorable! I love the new frame die. Aaauughh, those penguins!! How adorable! Love the frame and the warmer together-those penguins are so cute! PTI really does Christmas well! Thanks for helping us make it special for others. Gorgeous projects today! Love the beautiful color combos, and the ideas to use these products for different occasions. Lovely globes! Sweet penguins! Thanks for all the inspiration today! Warmer Together is so cute! Love the penguins! Oohhh…the penguin set is too cute! Love the snowflake frame/JOY die too. Love the bold borders-flurries. Designers have shown so many ways to use this die that I never would have thought of. These are awesome new products!!! I love a bunch of them, but I REALLY Love the snowflake border die!! Gorgeous!! What an absolutely adorable family of penguins! Those penguins are adorable! They look so fuzzy! The Bold Borders die is wonderful!!! Great work by the DT! Love the new Bold Borders! I love the Peace set with the Glorious Globes! I just love the tiny wreath and bird in the new Globes set. Adorable and versatile for all year round! LOVE the peace word die and sentiments. Beautiful release and inspiration! I love everything today! Penquins, peace on Earth on a globe, snowflake border… terrific! Gracias por los proyectos de hoy. Los colores sugieren algo no tradicional, yo prefiero los más claros. Oh my, where to begin? I love them all, each stamp & die set! The DT made adorable, wonderful & fabulous samples today (again, as usual). That JOY die is beautiful! Love all the additions to the globe theme too. Beautiful work by the DT! The penguins will be the first items in my basket on the 15th! I love the Bold Borders, and those cute penguins! Awesome release as usual! Can’t wait for the 15th! 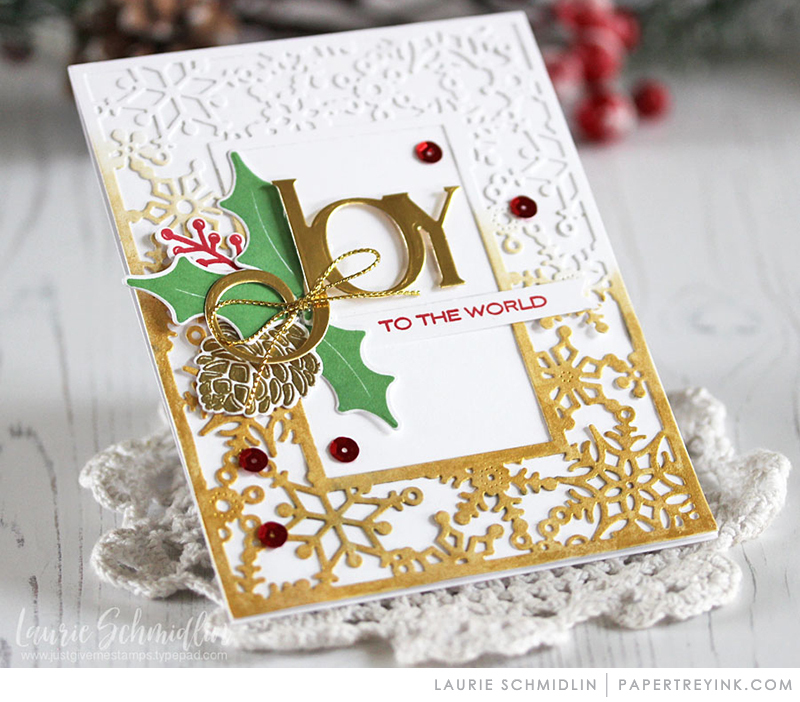 Laurie’s cards today are gorgeous! Love the globes and the peace die. Such lovely projects today! What really caught my eye was that “Joy” with bold Borders: Flurries. That oversized curly letter “J” is just perfect. The border frame and the peace sets are going on the list! I enjoyed the inspiration today! The penguins are just about the cutest I’ve ever seen! I like the new Bold Borders die. Thanks for the inspiration! 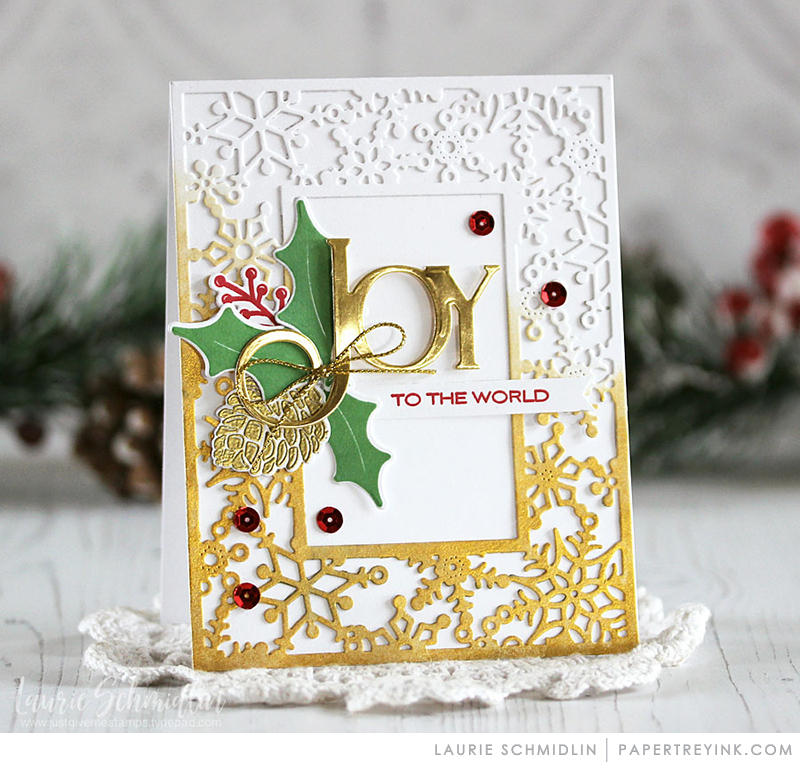 Love the Bold Border Flurries die – and Laurie’s card is gorgeous! This release just keeps getting better everyday. Love the penguins and the bold flurries frame die. Another great release like all the others. So much to love but that Bold Borders: Flurries is my favorite. Anything with JOY is right up my alley. The DT creations and color waves bring much joy to this post. I love all the new products and projects today! You gals are amazing! Those penguins are adorable! Love the Bold Borders and the beautiful JOY that comes with it. The globes are always fun, too! Great tags, also! Thanks for the inspiration and eye candy! Such beautiful sentiments, and penguins! Penguins! Wonderful cards and so creative! Loving this new release. Beautiful! I love the Joy die and the Borders! The penguins are a must have! those penguins are too cute! love the new bold borders flurries die… simply gorgeous! I love the words to live by series. I have many of them and can’t wait to add peace. The bold flurries border with the joy is gorgeous!!!! More great examples today! I like what the DT is doing with the Joy set, and aren’t those penguins cute? 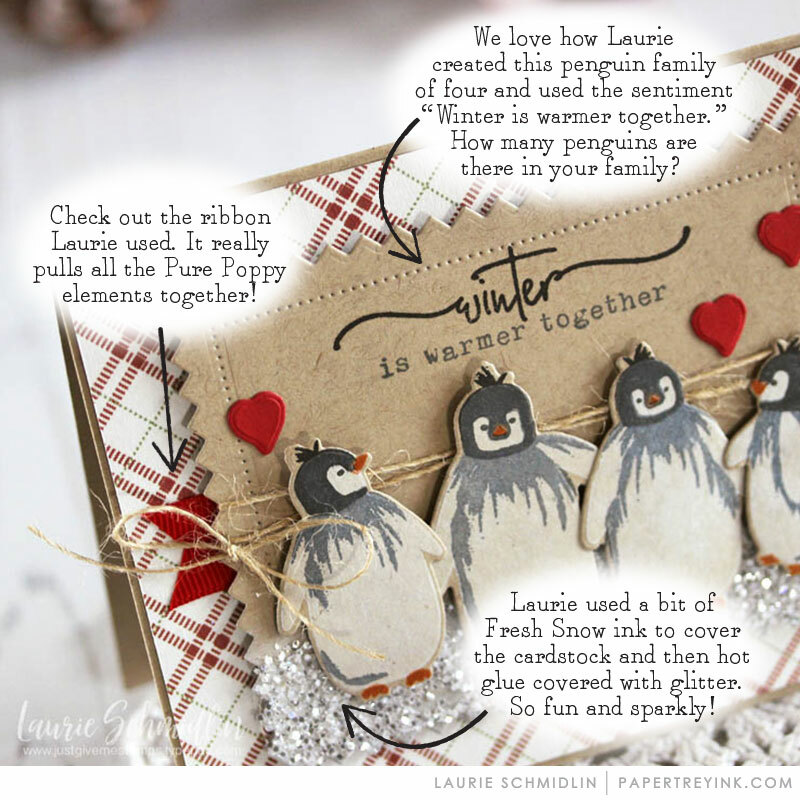 Adore those little penguins – what a cute set! The Words to Live By: Peace is adorable. The penguins are truly adorable. I also love those cute little wreaths. The delicate dies are beautiful. Lovely projects!! These are just too beautiful!! I am in search of a penguin stamp, this one come just in time, YAY! I love the global series …so much yo can do with them! My collection has been growing…Now I must think about penguins who knew!! Lots of color and cuteness today!! Love the penguins! A lot of great inspiration today! This release keeps getting better and better! 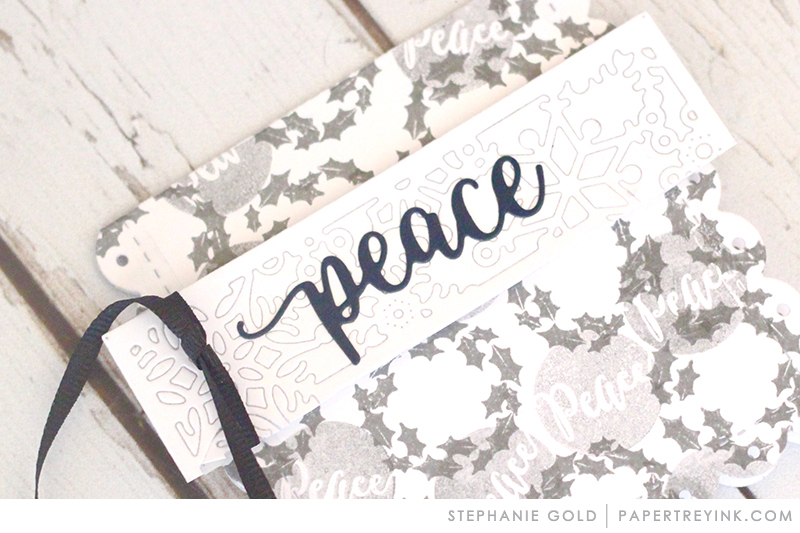 I really like the Bold Border die this month and the Words to Live By Peace, just what we need in this world. I always love your bold borders! I love Papertrey Ink! Always have, always will. What beautiful designs. OMG! The penguins are just too cute!! Penguins, globes, peace and bold borders…what’s not to like about today’s reveal. The DT has done a wonderful job of inspiring me…and probably everyone else too! 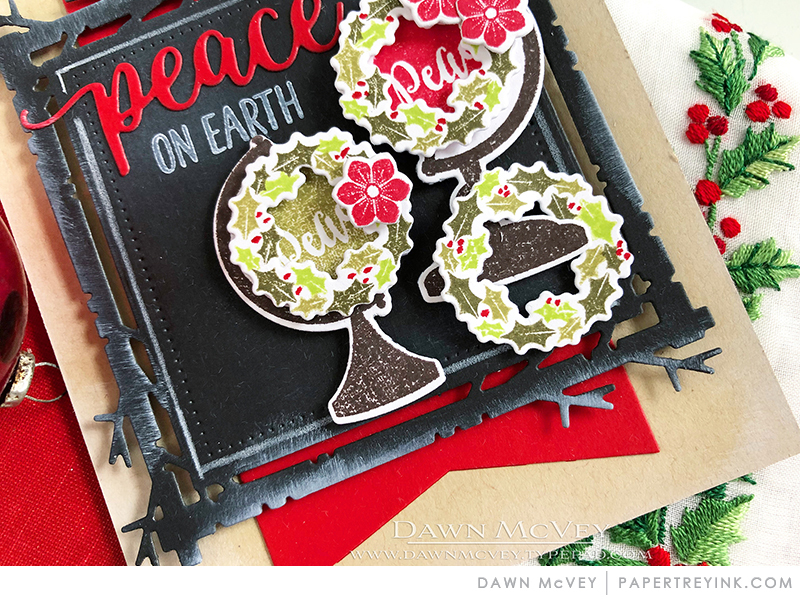 The Peace words and the new Bold Borders are beautiful I never would have thought of doing the snowflakes in red-on-red, as Laurie did, but that’s my favorite sample today! Those penguins are adorable! I’m loving the globes too! Totally love and NEED those penguins! Great samples from the team and those pengiuns are too cute ! I love the bold borders: flurries. The Bold Borders: Flurries is stunning!!!! Wow! My favorite today (if I have to choose just one! ), is the snowflake border die!! Awesome inspiration again today! Love the Bold Borders Flurries Die and the penguins are darling! Another day of beautiful creations! Loving the latest addition to the Globes set – fun images that can work even without the globe stands. I love the new borders die, and the penguins are so cute. THis is also my favorite of the globes series. LOVE the Flurries Frame and the new Globes set as well! Wonderful winter release! Am in love with this month’s release! So much coziness and loveliness! I am in love with the newest Bold Borders dies. The snowflake frame is so elegant and I love the simple beauty of the “joy.” Can’t wait to include this in my collection! The penguins are adorable and I like the new Bold Borders: Fluries die! So many beautiful examples and creative ideas! Love those penguins! Peace +Penguins = Perfection! Loving this entire release – and we have not even seen Dawn’s amaryllis yet! Those little penguins are so cute! And so realistic looking. 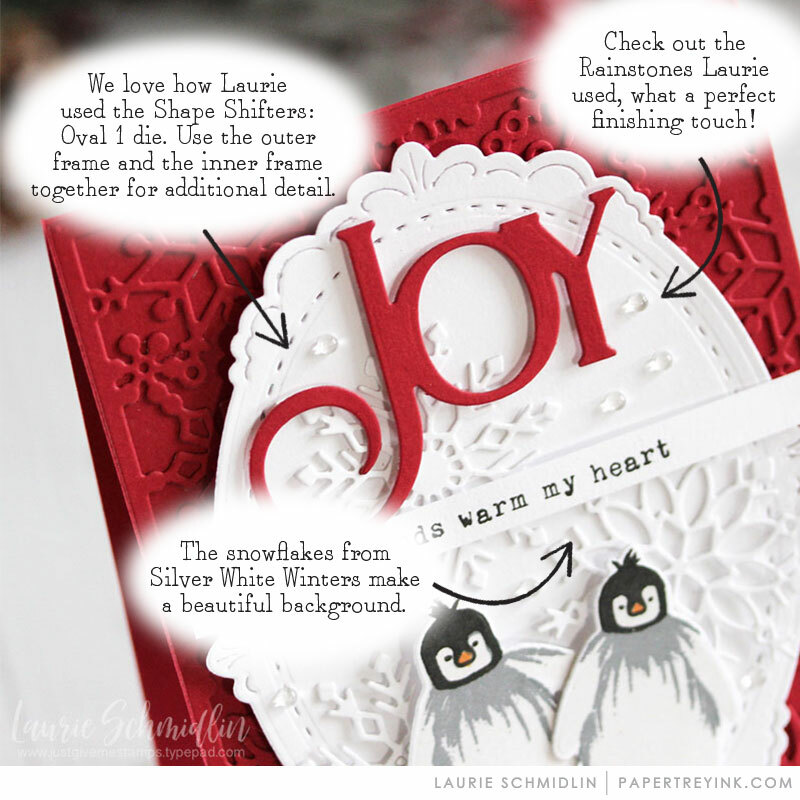 Awesome winter card ideas….using great new products! Such a cute cluster of penguins! Those are the cutest little fat penguins ever! 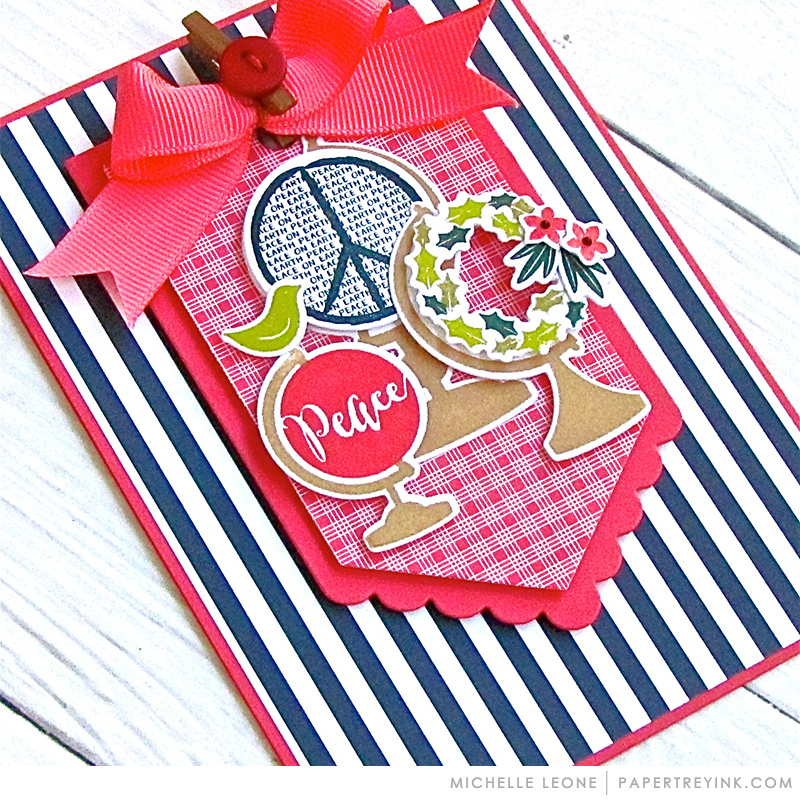 Love the Bold Borders and Warmer Together stamps and dies. Super cute. The penguins are utterly delightful! There is so much to love in this wonderful showcase of new products. How cute: penguins! I don’t know anyone who doesn’t love penguins! And great examples for card making, today! The penguins are a hoot and I absolutely love the Bold Borders: Flurry did! Gorgeous! You had me at penguins! So many beautiful projects today! Love the Bold Borders, the square Shape Shifters! Another great day! I love Betsy’s card with the globe additions as ornaments! And everyone’s penguin cards are so very, very adorable. Lots of inspiration here for sure! I love the penguins! Great projects today! The penguins are just adorable and will make such unique winter and Christmas cards! Love the new Flurry border die, who can resist a frame of snowflakes! That penguin line is just too cute! And JOY! Love! The design team did a great job with today’s offerings. Look at those adorable penguins! Bold Borders:Flurries is beautiful and the “joy” is stunning! Oh my goodness, such a cute waddle of penguins 🙂 I just LOVE the Bold Borders: Flurries and the beautiful creations from everyone today. Each reveal gets better and better! First the fawns, then the tiny mittens and stockings, now these adorable penguins. How am I ever going to decide? Guess I’ll just have to get them all!! I’m so inspired by all the beautiful designs your design team has created! I feel like I’m standing at your window saying, “Open, open, open”! Although I know you don’t have a window, I just can’t wait for the “Release, release, release”!! 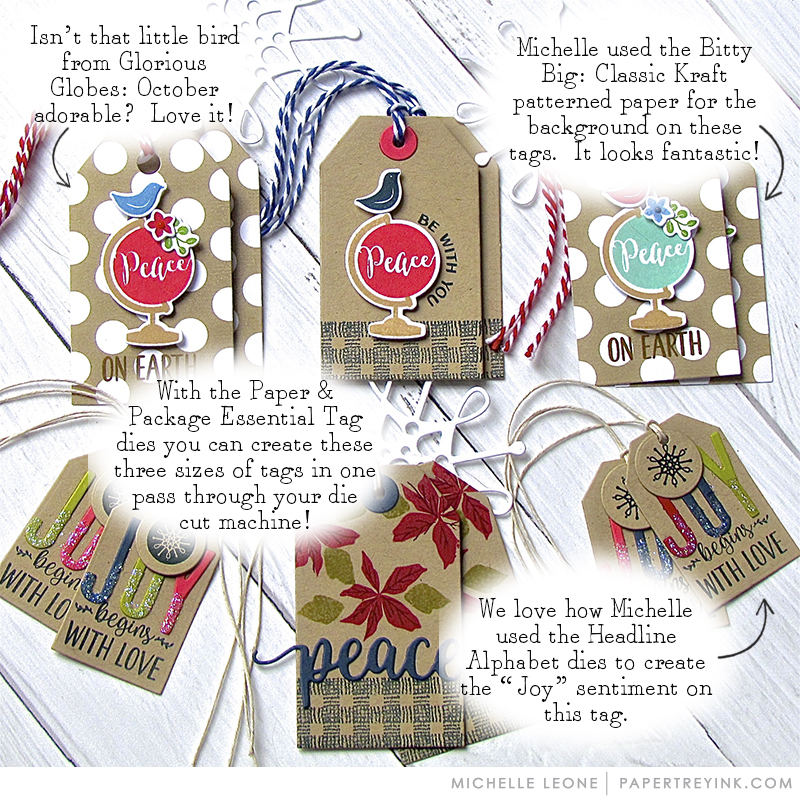 gorgeous cards and tags wonderful creations and ideas!!! The bolder borders; Flurries looks lovely! perfect for the holidays. Despite the cold, those penguins really melt my heart! The DT projects are all so fabulous with these fun products! Another great release day! Love the color combination of silver and red used in the bolder border set. Another wonderful release day. The penguins are so cute. The design team just keeps hitting it out of the park! The new globes set is cute! Oh my, those penguins are so adorable! 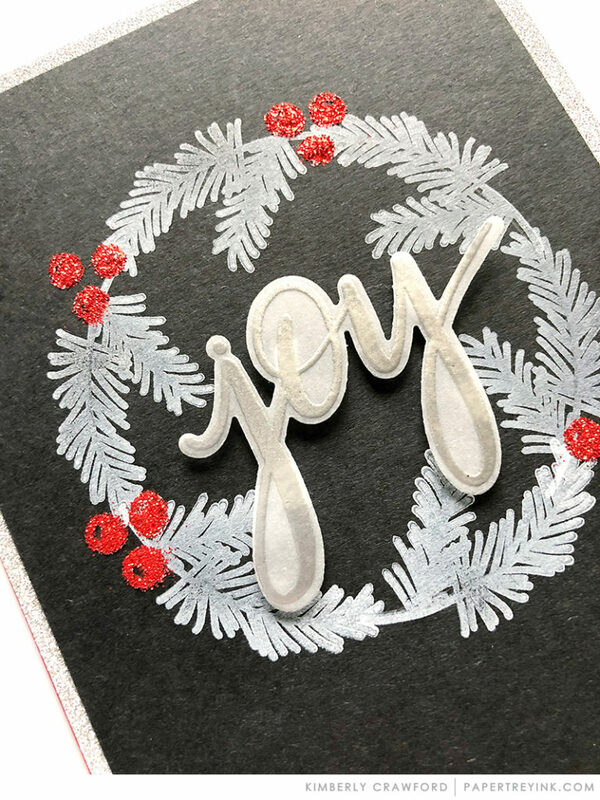 Kimberly’s “Joy” card with the delicate wreath is stunning! Loving all the eye candy today! The globes look great as ornaments, so clever! Loving that penguin too….another great release! Love the bold borders snowflake. And somehowI missed the fact there are penguins! So cute! Those penguins are just adorable!! So FUN!! I am definitely in love with the flurries frame and those adorable penguins!! In love with today release: the stamp designs, the color combinations, the new dies, the messages …. AWESOME!!!! Those penguins are so cute but I love the Bold Borders Flurries die! Betsy just keeps the cuteness coming this month!! Love everything I see and the examples are sooooo cute!!! OMG Warmer Together is adorable!!! Have been a fan of the Glorious Globes series from the beginning and this months design is absolutely perfect for the season. Looking forward to adding this one to my collection. Oh my, looking forward to this release! 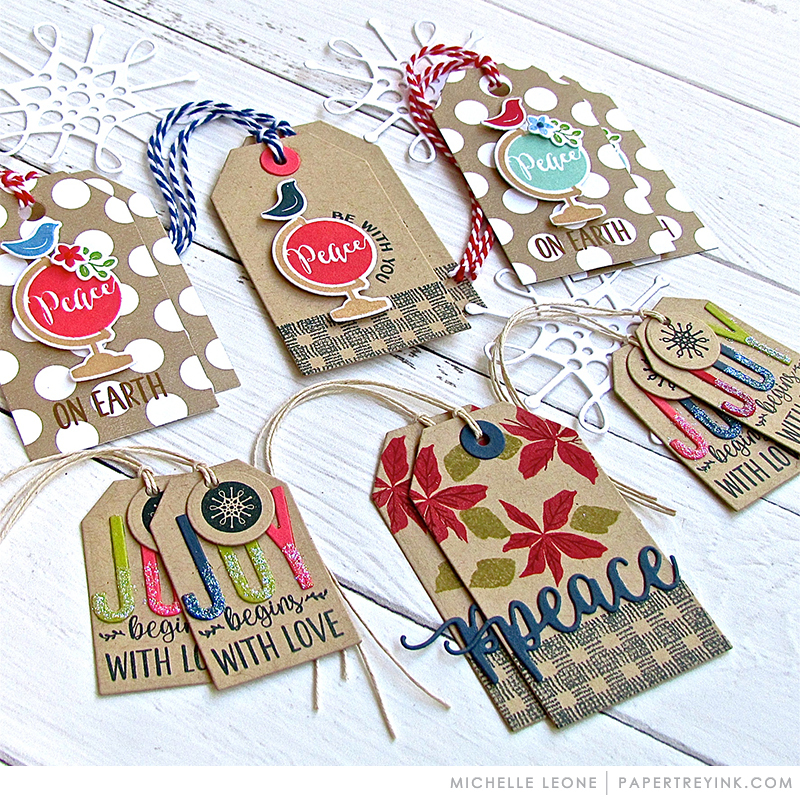 Christmas is my favorite time for crafting and Papertry Ink stamps and dies are part of the cardmaking tradition. The team’s designs are inspiring! My favorite today is the Bold Borders Flurries. I enjoy watching the video and seeing all of the creations! Thanks! So many fun and clever ideas! Love the penguins! I can tell already that this is going to be an expensive release for me! So many beautiful products! Lovin’ what I see! Wondering what the next 2 days will bring! Snowflakes and penguins, could it get any better. 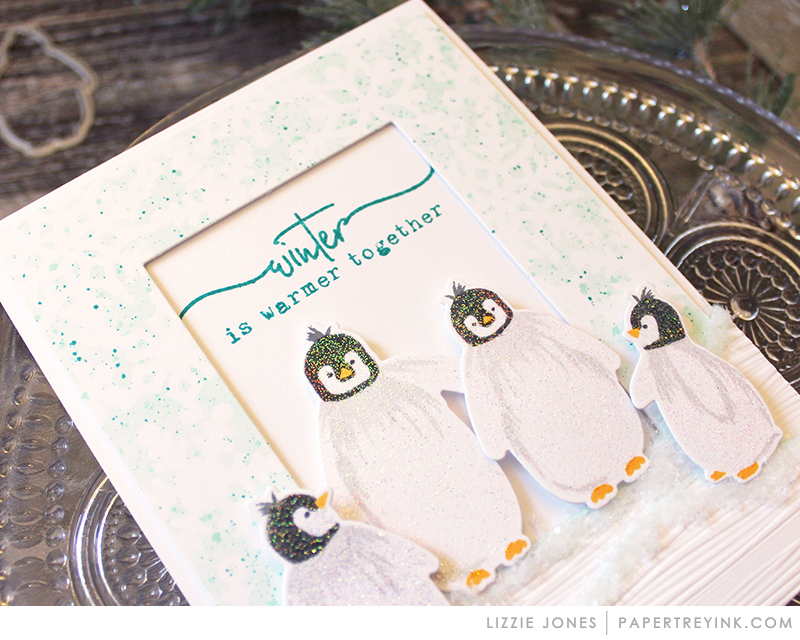 Those penguins are cute and like the JOY and snowflake frame – it’s all good! Thanks! 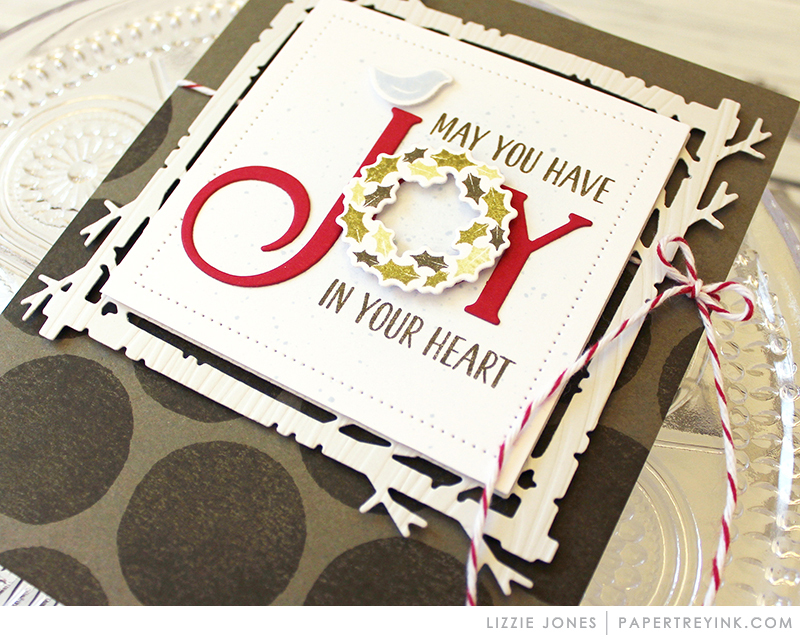 I love the Bold Borders: Flurries and the gorgeous font of the word, “Joy”. 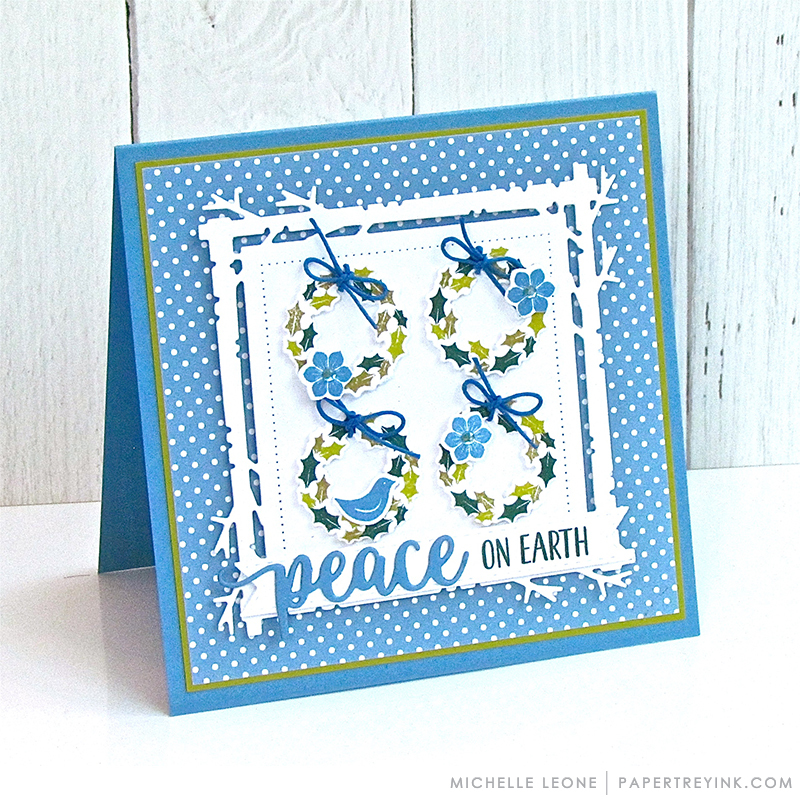 The wreath in this month’s Glorious Globes is also beautiful in Michelle Leone’s card. I always love her style of cardmaking! I have a friend who LOVES penguins!! I NEED these to make cards for her! Such pretty projects with all the new amazing products! Can’t wait! Squeee – the penguins in the Warmer Together set are just adorable!!! Very excited about the Bold Borders: Flurries die as well. Those little penguins in Warmer Together are adorable! Bold Borders: Flurries is a great addition. Lots of great cards and tags. The penguin’s are just so cute!!! Loving Lizzie’s new Glorious Globes: October set. I am loving all the new products in this new release but have to say that the dies are calling to me in a big way!! Papertrey ink never fails to impress…..!! 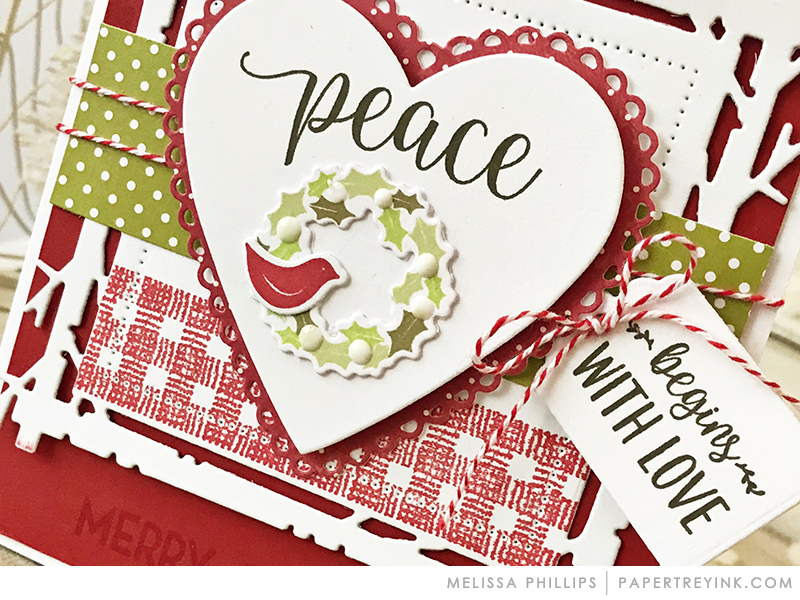 Love the new flurries border and Betsy’s peace sentiments! Cute penguins too. Ooooohhhhhhh! Those little penguins! They are everything!! That bold borders is on my list! Love, love, love this release! The new flurries border, penguins, and joy are on my purchase list. The Globe series is my favorite series this year. The globe with the peace sign is perfect for the holiday season. What a wide variety of cards could be made with a little $5 set. I love that set of tags. Would love to make some to hang on holiday gifts this year. Bold border die is gorgeous. Love the new globes and the flurries border! Love the bold borders-flurries. Thanks for the chance to win. Lots of pretty things. That joy die in this month’s bold borders set is so striking. Love the tags using the Globe set this month and those adorable penguins! Beautiful cards! Can’t even pick a favorite! Thanks so much for sharing your creativity! Oooh, I love the Bold Borders: Flurries die. such great inspiration overall! Beautiful! Love the little wreathe and those beautiful sentiments. Darling! Love love love the flurry boarder!!! Those little penguins are super adorable as well!!! Wow! As always, the Bold Borders die is gorgeous! And I love the Words to Live by set! Absolutely wonderful.. love it all. The penguins are super adorable, and I love the holiday sentiments for this year. Wonderful job by the design team! Love the super cute penguins. This release in incredible; there is so much to love. Everything is looking so great. And wonderful inspiration from the team. Wow, everything looks so inspiring. Love so many things again from this release. Warmer Together is so cute and Bold Borders:Flurries is beautiful! The Warmer Together set is so cute! I adore making tags, but usually run out of time. There have been so many gorgeous tags this week that maybe, just maybe, I’ll be so inspired that I’ll make the tags before the cards this year. Thanks for the chance to win a gift certificate! What a great release. Love the border die. Great projects by the design team. Oh, I’m loving those adorable little chubby penguins!! Love Bold Borders this month! I especially love the Joy die! Awesome! Love this month’s Bold Borders, and especially the beautiful Joy die! I love all the peace sentiments too. Wonderful inspiration from everybody! OMG! 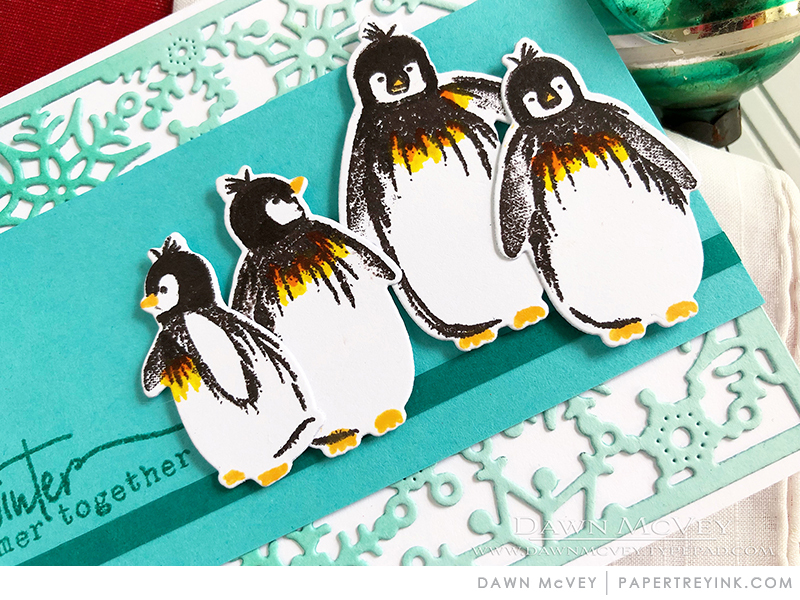 The Penguins and the Bold Border die are absolute must haves… Can’t wait for Monday! So many lovely cards and tags today. I think the penguins are my favourites today, but all else is great too. How cute are Glorious Globes? The shipping tags are adorable. Those penguins are so cute! And loving the new bold border die! Fabulous projects today! Loving the globes! Amazing work ladies. OMG those penguins are the cutest thing i have ever seen. They are so gorgeous. You are getting better and better with every release. Love the new penguin stamps and the Bold Border. 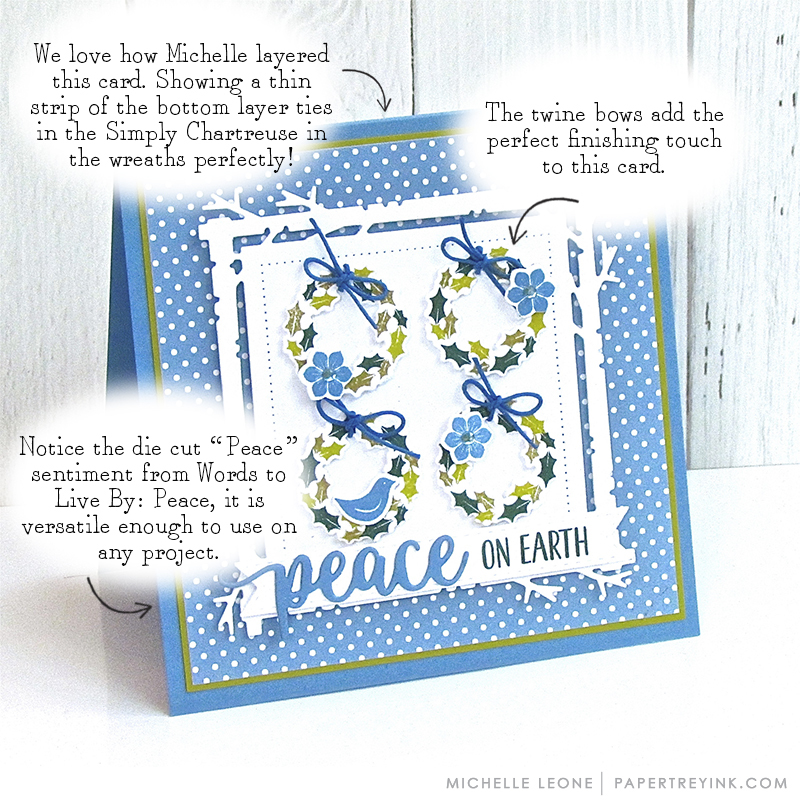 The Flurries border is adorable, with the die words Peace and Joy, it doesn’t get much better! Another great release. Love the snowflake frame. Everything is simply amazing! I love it all. Love the penguins and the snowflake frame is WOW! Those penguins are so sweet! The snowflake border is beautiful too! Love the new Bold Borders!! Bold Borders: flurries is such a great die to have for all winter long. Awesome, more glorious globes to add to my collection! So many fun things! I love the new Bold Borders: Flurries die. I love anything to do with Christmas. So many beautiful projects. How adorable are those penguins! What beautiful and fun new products! Gorgeous inspiration -festive, elegant and vibrant. Love the globes, the joy, and the wreaths, but it’s all amazing. Great inspiration. Happy Holidays! I gotta have the Bold Borders! I love snowflakes. I am loving the globes and penguins. Everyone made such adorable creations. I’ve been catching up on the videos because I’ve been down with a cold all week. Great job everyone! Love the globes, and who doesn’t like penguins! There’s so much to love about this new release! 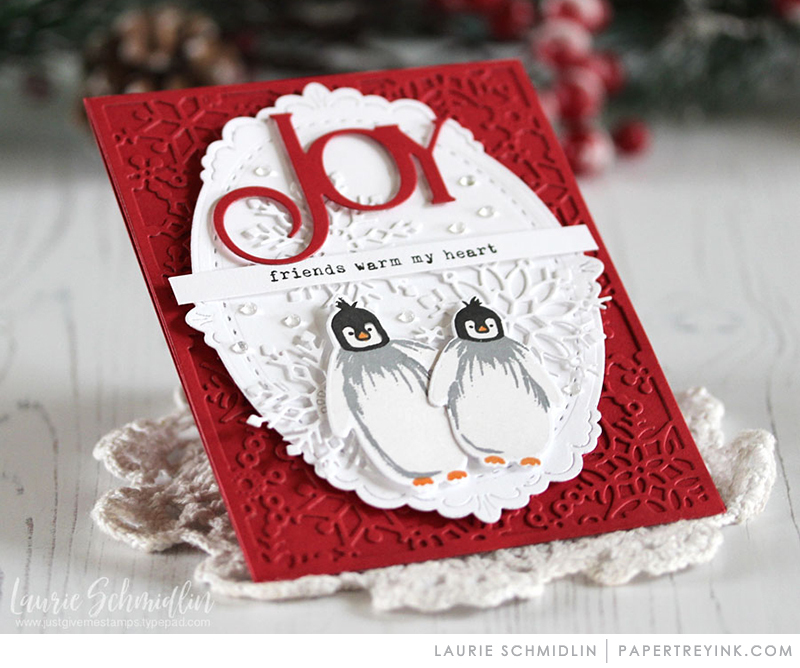 Those playful penguins are so darling and the snowflake border is fabulous for all winter cards. Wow! 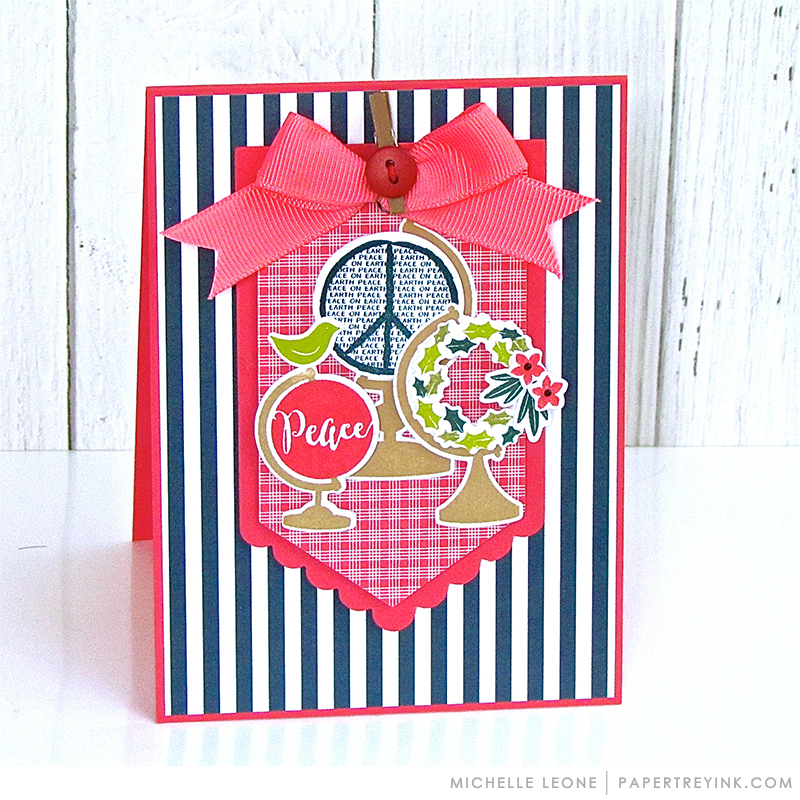 I especially love Michelle’s Blueberry Sky card and Betsy’s water colored card, both using the newest Glorious Globes. Those tags are adorable! Thanks for all the inspiration! Oh my gosh! So many cute projects!